Before this pump was constructed our children and wives normally woke up very early in the morning to fetch dirty water. 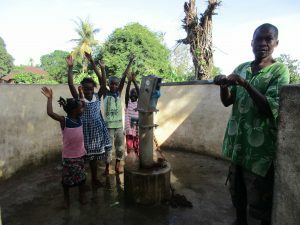 A year ago, generous donors helped construct a well for the community around 7 Kamara Taylor Street in Yongoroo, Sierra Leone. Because of these gifts and the contributions of our monthly donors, partners are able to visit project sites throughout the year, strengthening relationships with communities, and evaluating the actual water project. These consistent visits allow us to learn vital lessons and hear amazing stories – we’re excited to share this one from our partner, Nanah Mansaray, with you. During the rainy season in Yongoroo, near Kamara Taylor Street, a murky, contaminated open stream does not see the traffic it did a year ago. This year many of those who were making the daily walk to the stream for drinking water are now able to draw clean water directly from the pump at 7 Kamara Taylor Street. 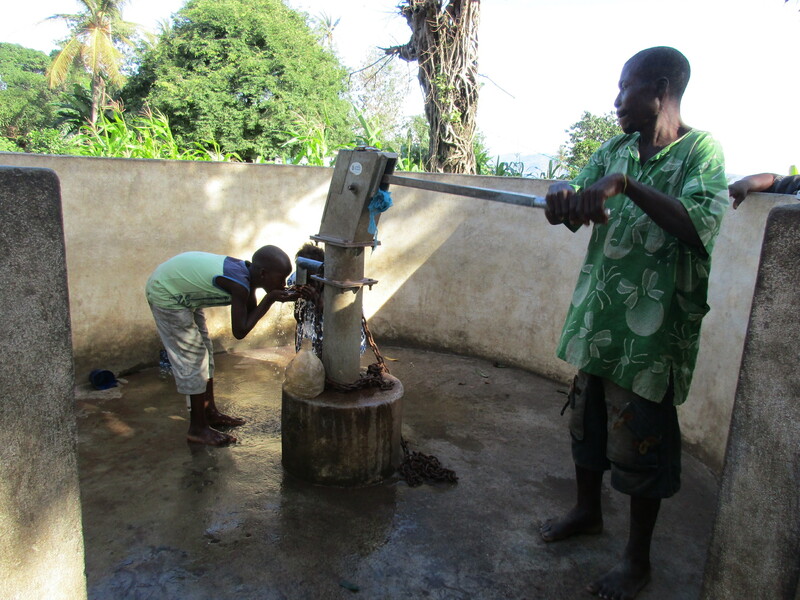 Nanah Mansaray, a field worker for Matiatu’s Hope, reports, “The pump is working properly and the community people are really enjoying the facility.” Consistent access to clean water is definitely a source of joy in this community. Kadiatu drinking clean water from the pump in Yongoroo. Kadiatu Kamara, age 10, shares, “The biggest change that have happened in my life since this project was completed is that I would normally go to the stream to fetch water, which was not clean and safe, for drinking, but now I have access to clean and safe water for drinking, bathing and even laundry. I am very happy about this facility.” Because fetching water is primarily the responsibility of the women and children, the countless hours spent accessing water inhibit the ability for many to fulfill school obligations or explore wider family, social, or business possibilities. However, the community now has eyes on new possibilities. 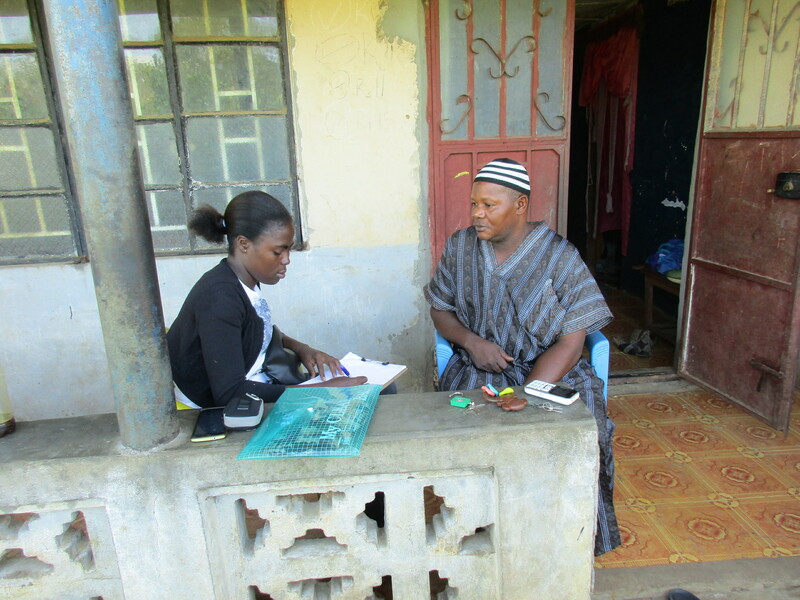 Nanah Mansaray interviewing a community member about changes he’s witnessed over the last year. Clean water is definitely a critical component to improved health in Sierra Leone, yet training in hygiene and sanitation is the work that makes improved health truly sustainable. Mariatu’s Hope continues to monitor and engage the community as they work toward long-term sustainable sanitation and hygiene practices. While it may seem like one project is just a drop in the bucket, this functional well on Kamara Taylor Street is changing many lives that will in turn change many lives. The ripple effects of these projects are truly astounding. We are excited to stay in touch with this community and to report the impact these heroes make as they continue on their journey with clean water. When you invest in The Water Project, you're investing in people like Kadiatu Kamara. Your gifts help us reach more communities with the gift of clean, safe water. And every drop helps unlock potential.